Nokia Ara is an Orthopedic tool that monitors patients with knee injuries and personalises their therapy. The majority of sport injuries involve the lower body, particularly knee injuries where roughly 2,5 million people each year get injured. Once the knee is weakened the risk of injuries increases and in many cases the functioning will never go back to the way it used to be. The goal of this project was to empower patients who suffer from damage to the Anterior Cruciate Ligament (ACL) to recover their health in a faster and easier way. Interviews, shadowing sessions and workshops were done with patients, athletes, surgeons and therapists to gain in depth understanding of the rehabilitation process. Today there are many problems, but the most important one is that every injury is unique, and requires a personalised rehabilitation process. Unfortunately therapy now is standardised and dependent on the therapists expertise. What if we could empower patients to recover their health in a faster and easier way through a personalised rehabilitation plan. The result of this collaboration is Ara, the smart rehabilitation bracelet. 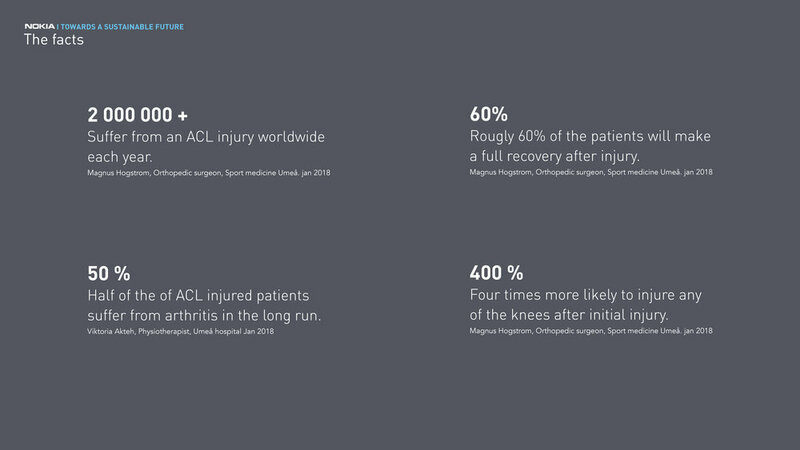 Ara continuously monitors the injured knee to provide an increased amount of insights, which enables practitioners to take humanized, and data driven decisions to personalize the rehabilitation plan for each individual. It empowers patients to take an active part in their own rehabilitation by providing life and precise feedback on their activities throughout the day. 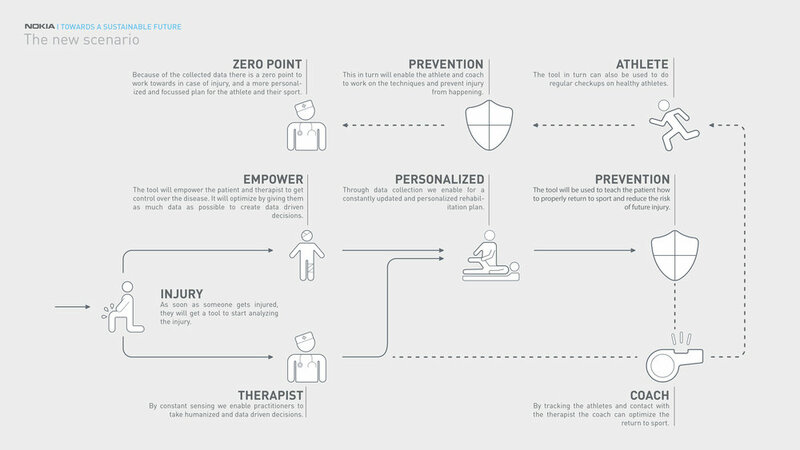 How might we empower ACL patients to recover their health in a faster and easier way through a personalized and humanized rehabilitation plan? How might we provide an increased amount of insights for the practitioner to take humanized and data-driven decisions? To approach the design challenge first a new scenario had to be created in which the current rehabilitation process was challenged an optimised. The resulting scenario now works as follows: As soon as an individual gets injured, he/she receives Ara, who starts to monitor the injury. This information is then shared with the therapist which enables him/her to take data driven decisions and inform the patient about their injury and how to get better. Through this, patients will receive a personalised rehabilitation experience which ends with teaching individuals how to prevent the injury from happening again. Furthermore this device can be used by individuals and athletes who then reduce the risk of injuries from happening by working on preventive training. All this data can then be collected in a general database which in turn helps healthcare providers get a better understanding of the injury and optimise the rehabilitation processes for each individual. 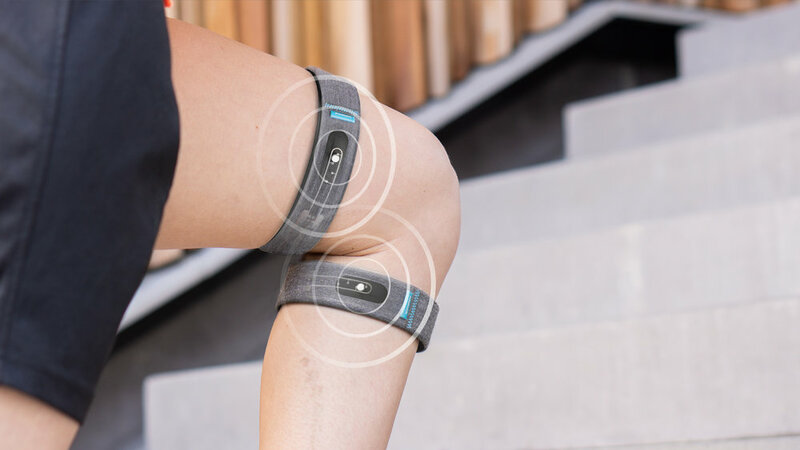 Meet Ara, the smart rehabilitation bracelet! Through constant sensing Ara provides an increased amount of insights for the therapists to take humanized and data driven decisions. Which results in a more informed, easier, faster and reassured rehabilitation experience for the patient. The concept consists of three main items, a bracelet (to monitor the patients injury), an app (to communicate and adapt the therapy) and a charging unit. Since patients will be wearing Ara throughout the biggest part of the day, they do not wish to wear technology visually, but just get the benefits. Because of this a minimal design was created on the outside of the product. Patients receive Ara form their therapists who will first calibrate the device on the healthy knee of the patient. This is to gain a so called "zero point" as a reference what strength the other knee should have at the end of the rehabilitation. By doing this the therapist ensures that the patient will regain proper balance and the therapy has its goals optimised for each individual. One of the biggest problems with rehabilitation is to know when you have done enough exercises for the day. If patients push themselves too far, they risk further injuring the knee, instead of rehabilitating it. To ensure that patients don't push themselves too far Ara has several vibration engines integrated into the bracelet. These will vibrate when direct feedback is needed, for example when they need to take a break. When patients have to perform exercises for their therapy it is important that they learn the correct technique. This since it will help them to reduce the risk of future injuries from happening. Ara comes with an App that will give life feedback to patients when performing these exercises and will serve as their personal rehabilitation coach. The patient app empowers patients to take an active role into their own rehabilitation. It will show users their medical information, such as the facts about their injury, and how it has evolved over time. It will show the activity of the day and warn them if they should let the knee rest for a while, or stimulate them to do more, to make sure the knee doesn't turn stiff. Through the contact page patients and therapists are able to communicate about the injury in a secure way and also share photos and videos when they would like more precise feedback. By showing the improvement over time patients will be motivated to continue their training and the app will allow patients to celebrate and share achievements with their environment. Nowadays the therapist sees patients roughly once a month. A large part of these meetings consists of the therapists performing checks to see how the injury is evolving. By sharing the information that Ara collects with the therapists this will no longer be needed and the time can be spend on the treatment. Furthermore the application allows the therapists to perform remote monitoring of the patients and to adapt their therapy when this is needed. Ara will share the results and make recommendations but the final decisions stays with the therapists. As described in the scenario Ara can also be used by individuals who wish to reduce the risk of injuries from happening in the first place. This is done by using one bracelet on each leg when doing exercises. This since the balance and motion of the legs in comparison is more important then to get precise data of the knee. The performance app will teach people the proper techniques and methods adapted to their desired activities and built. For example when you are a basketball player it will focus more on your technique of landing whilst for soccer a quicker reaction time of the muscles is more important. Ara is designed with sustainability in mind. This means that it is developed not only thinking of what happens to the product in this lifecycle but also its next. Through the use of a QR code Ara is linked to a product passport which shows how to disassemble to product and gain back its materials and components. By simply cutting the blue thread on the outside of the product and polling on the Nokia tag, the product is disassembled in all the different components it contains. The textiles can be composted and used for their biological nutrients and the sensors and technology slab can be easily recycled by just melting the plastic outer layer of the components. Traditionally when we think of sustainability, we consider that these product will be more expensive for companies to produce. With Ara we prove that it is in fact profitable to be sustainable. By thinking of sustainability form the very beginning we have optimised the assembly and recovery process of the product, and since Nokia will be able to reuse all the materials and components they will gain back value from what otherwise would be considered waste. 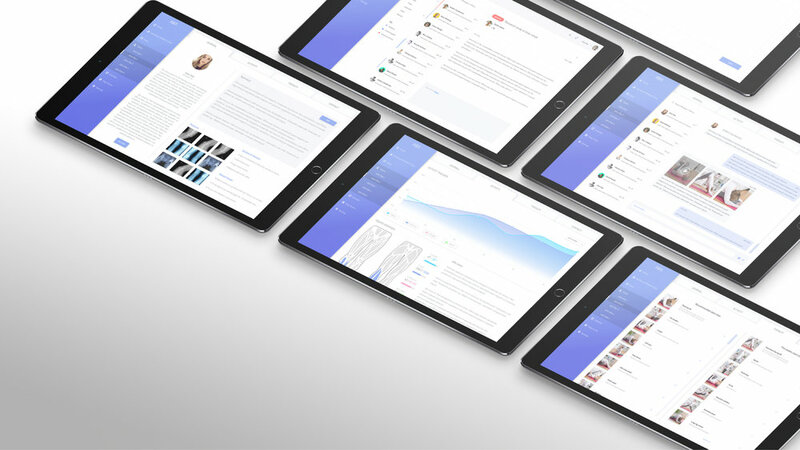 iF jury statement:"A thoughtful and practical design that really helps."